Available in 2 - 8 foot lengthsThis ultra-strong, single-fold ramp provides the safety and strength required while remaining lightweight and portable. The smooth and quiet action of the living hinge, a continuous full length low profile hinge, adds strength and stability to the ramp. 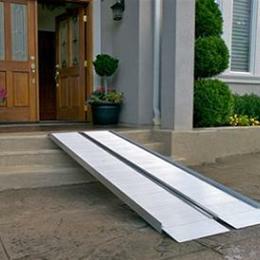 Features an extruded non-skid tread for superior traction, and a self-adjusting bottom transition plate for easy conversion from ramp to ground.Welded construction provides long-term durability and safety.